A beekeeper is a person who keeps honey bees (i.e. 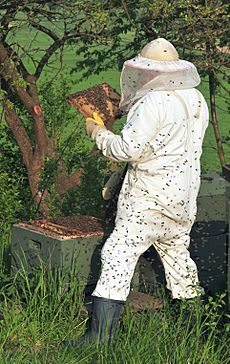 practices beekeeping). Honey bees produce commodities such as honey, beeswax, pollen, propolis, and royal jelly, while some beekeepers also raise queens and bees to sell to other farmers and to satisfy scientific curiosity. Beekeepers also use honeybees to provide pollination services to fruit and vegetable growers. Many people keep bees as a hobby. Others do it for income either as a sideline to other work or as a commercial operator. These factors affect the number of colonies maintained by the beekeeper. 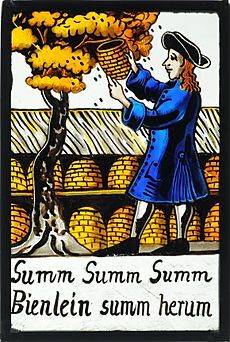 Beekeepers are also called honey farmers, apiarists, or less commonly, apiculturists (both from the Latin apis, bee; cf. apiary). The term beekeeper refers to a person who keeps honey bees in beehives, boxes, or other receptacles. Honey bees are not domesticated and the beekeeper does not control the creatures. The beekeeper owns the hives or boxes and associated equipment. The bees are free to forage or leave (swarm) as they desire. Bees usually return to the beekeeper's hive as the hive presents a clean, dark, sheltered abode. Most beekeepers are hobby beekeepers. These people typically work or own only a few hives. Their main attraction is an interest in ecology and natural science. Honey is a by-product of this hobby. As it typically requires a significant investment to establish a small apiary and dozens of hours of work with hives and honey equipment, hobby beekeeping is seldom profitable outside of Europe, where the lack of organic bee products sometimes causes buoyant demand for privately produced honey. A sideline beekeeper attempts to make a profit keeping bees but relies on another source of income. Sideliners may operate up to as many as 300 colonies of bees, producing 10–20 metric tons of honey worth a few tens of thousands of dollars each year. Commercial beekeepers control hundreds or thousands of colonies of bees. The most extensive own and operate up to 50,000 colonies of bees and produce millions of pounds of honey. 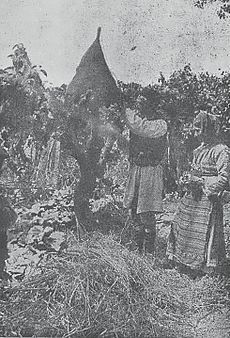 The first major commercial beekeeper was probably Petro Prokopovych of Ukraine, operating 6600 colonies in the early 19th century. Moses Quinby was the first commercial beekeeper in the USA, with 1200 colonies by the 1840s. Later (1960s-1970s), Jim Powers of Idaho, USA, had 30,000 honey producing hives. Miel Carlota operated by partners Arturo Wulfrath and Juan Speck of Mexico operated at least 50,000 hives of honey bees from 1920 to 1960. Today, Adee Honey Farm in South Dakota, USA, (80,000 colonies) and Comvita in New Zealand (30,000+ colonies) are among the world's largest beekeeping enterprises. Worldwide, commercial beekeepers number about 5% of the individuals with bees but produce about 60% of the world's honey crop. 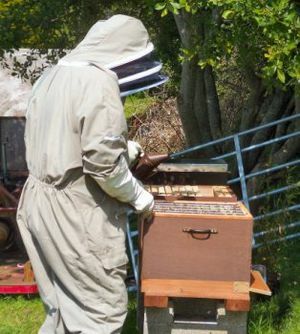 Commercial beekeeping is on the rise especially in high-value markets such as pollination in North America and honey production (especially Manuka honey) in New Zealand. Most beekeepers produce commodities (farm products) for sale. Honey is the most valuable commodity sold by beekeepers. Honey-producer beekeepers try to maintain maximum-strength colonies of bees in areas with dense nectar sources. They produce and sell liquid and sometimes comb honey. Beekeepers may sell their commodities retail, as self-brokers, or through commercial packers and distributors. Beeswax, pollen, royal jelly, and propolis may also be significant revenue generators. Taiwanese beekeepers, for example, export tonnes of royal jelly, the high-nutrition food supplement fed to queen honeybees. Modern beekeepers seldom keep honeybees exclusively for beeswax production. Beeswax is harvested along with honey and separated for sale. 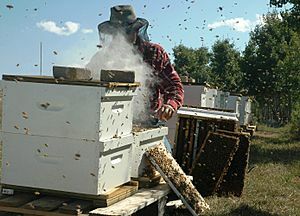 Some beekeepers provide a pollination service to other farmers. These beekeepers might not produce any honey for sale. Pollination beekeepers move honey bee hives at night in vast quantities so fruits and vegetables have enough pollinating insects available for maximum levels of production. For the service of maintaining strong colonies of bees and moving them into crops such as almonds, apples, cherries, blueberries, melons, and squash, these beekeepers are usually paid a cash fee. Queen breeders are specialist beekeepers who raise queen bees for other beekeepers. The breeders maintain select stock with superior qualities and tend to raise their bees in geographic regions with early springs. These beekeepers may also provide extra bees to beekeepers (honey producers, pollinators, or hobby beekeepers) who want to start new operations or expand their farms. Queen breeders use Jenter kits in order to produce large numbers of queen bees quickly and efficiently. Beekeeper Facts for Kids. Kiddle Encyclopedia.